4-26-11 Today was the first day of filming for The Flight of Man, and we got the insanely cool opportunity to film on the Universal Studios Backlot! We got to film in the European street section, which is so magical! Makes you feel like you have traveled to another land! 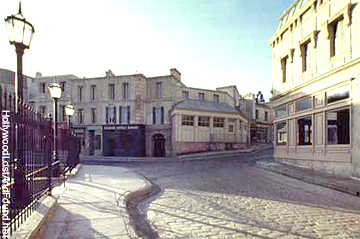 And yet it feels so familiar...probably because so many other movies have filmed there! We are now a part of that movie history! Since I am the editor, I am doing DIT on set (Digital Imaging Technician), which means I get to set up a laptop and a couple of hard drives and make sure there are plenty of places for the footage to go so everyone's hard work doesn't go to waste! The editor doesn't usually fill this position, but I'm really glad I get to do it! Not only because I am able to be on a cool set with amazing people, but also because I get to set up the footage just how I like it before I edit it. It also means I get a chance to edit on set in my downtime. I get to cut stuff immediately! As we move more and more to digital media, I wouldn't be surprised if this starts happening more often! "...and over here, Zachary Gladwin is shooting his next film!" We're famous! Haha. Well now I have to go finish prepping the footage for my edit, but stay tuned for more updates as the week progresses!